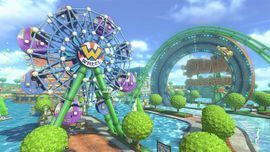 Water Park is the second race track of the Mushroom Cup in Mario Kart 8 and Mario Kart 8 Deluxe. This course takes place in an amusement park with Submarines that travel along the track and balloons that float out of pipes. Nokis, Toads, and several yachts fill the area as well. There are thirty Coins located on this track. Water Park appears to be a flooded amusement park that is water themed. A partially flooded hotel and the Waluigi Sea Bed rollercoaster can be seen in the background, but the natives seem to have adapted to the park's flooded state. There are yachts and boats visible in the background and the park seems to still be in operation although certain rides are completely submerged, such as the Aqua Cups ride. The course starts at the entrance to a ride known as the Sub Coaster. After going through the entrance building, the course splits into two jumps leading into a short underwater section. Soon after that, the course turns to a large anti gravity loop. On this loop, as well as before it, characters can hit the Marine Coasters and get a boost because they have Spin Boost pillars on the bottom of them. After the large loop, the track once again goes underwater leading to a curve around an Aqua Cups ride. Shortly after the turn is a gliding ramp leading to another ride called the W Wheel as well as the finish line behind it. Players can use a Mushroom to boost across the Aqua Cups ride instead of taking the turn around it. The staff ghost for this track is Baby Luigi on the Mr. Scooty, with a time of 2:02.954. In Mario Kart 8 Deluxe 200cc, the staff ghost is Baby Mario with a time of 1:22.799. A released screenshot of the course revealing the name of the track. The large loop in the track. Wendy at the entrance to the ride. The W Wheel at the end of the track. The stamp obtained for beating the staff ghost at this course. The map of the course is seen on some billboards around the course, likewise with Rainbow Road and GCN Yoshi Circuit. The Aqua Cups ride has the merry-go-round music from Super Mario 64 (Big Boo's Haunt). This is one of six courses in Mario Kart 8 where at least one anti-gravity zone doesn't end with a trick ramp or glider ramp, the others being Mario Circuit, Twisted Mansion, Rainbow Road, N64 Rainbow Road, and Wii Wario's Gold Mine. In 200cc, it is possible, along with Wii Grumble Volcano and others that have a gliding pad before the checkered banner, to hit the finish line banner if one has the right combination of kart and character. But unlike Mario Circuit, DS Wario Stadium, and 3DS Neo Bowser City, it does not interact with the player. Posters in the entrance for the Sub Coaster show the structure of the Sub Coaster cars, the structure of a Mecha Cheep and the height requirement for the ride (being taller than a Goomba). The History of the Submarine posters say the first generation model was manufactured in 1987. 1987 was the year Famicom Grand Prix: F-1 Race was released; the first racing game to feature Mario characters. This course appears on some of the posters for the sponsor Galaxy Air. This page was last edited on June 18, 2018, at 16:11.